Tooth discoloration can happen in one of two ways: from foods and beverages that stain, or from medications. At-home teeth whitening systems attack both forms of discoloration, though some work better than others. Choosing a kit that’s right for you has as much to do with your personality as it does the effectiveness of the product. A pearly white smile is striking. It communicates health, confidence, and good old-fashioned attractiveness. Unfortunately, some of our most beloved treats — coffee, tea, candy, and wine, namely — leave their mark over the years, turning a white smile dull or yellow. While you could shell out money for a snap-on-smile or porcelain veneers, at-home teeth whitening kits offer a more affordable option. Here’s what you need to know about these products, with some advice on how to choose the treatment that’s best for you. Teeth whitening products offer convenient, inexpensive ways to touch-up dull or discolored teeth. While these products all work to accomplish the same goal, effects can vary from product to product, and from person to person. Whitening kits also vary when it comes to cost, ranging anywhere from $20 to $300. For these reasons, it helps to do a little research beforehand so you can save yourself a little money and perhaps a little pain. In general, tooth discoloration takes two forms: intrinsic and extrinsic. Intrinsic stains occur during childhood. They can result from taking certain types of antibiotics, suffering severe illness, or ingesting excessive amounts of fluoride. Extrinsic discoloration develops as the effects of certain foods, such as blueberries and coffee, or certain habits, such as smoking, start to stain the enamel on teeth. Whitening trays and strips generally rely on bleaching compounds like carbamide peroxide and hydrogen peroxide. Activated charcoal kits contain a mildly abrasive powder that “scrapes” the stains off your teeth. A third type of whitening treatment combines a bleaching compound with LED light to enhance the whitening effect. At-home and professional whitening systems also differ widely, according to Dr. Deborah Yarmush, a dentist in Walpole, MA. In her opinion, at-home kits are usually a good choice for younger patients. Dr. Timothy Stirneman of Compassionate Dental Care in Illinois notes that in-office treatments are also the best choice for people who want fast and dramatic results, but aren’t as concerned about cost. 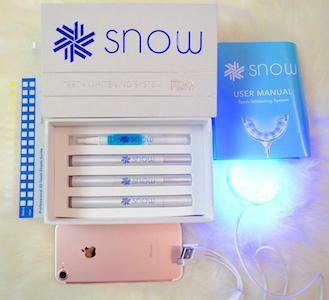 Based on the feedback the Zwivel team has received from visitors who bought an at-home teeth whitening kit, Snow ranks very highly. The following at-home kits are among the most popular on the market. Each comes with its pros and cons. Knowing what has caused of your smile to lose its brightness will have an impact on your final choice. Also ask yourself if you will enough time — and the discipline required — to follow these treatment plans. 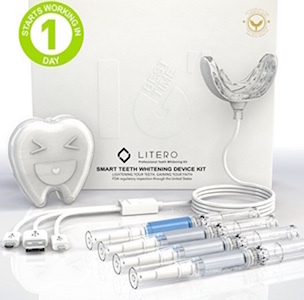 The LITERO Professional Teeth Whitening Kit employs a unique system compared to its competitors. This system uses handheld pens to apply the whitening gel to the teeth. After applying the gel, a mouthpiece is used to shine LED rays on the teeth. Total application time is 16 minutes. The whitening gel consists of a “desensitized” formula that doesn’t burn or irritate the mouth. 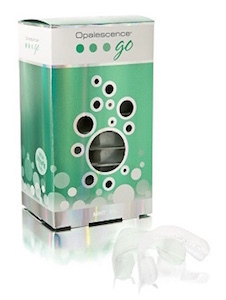 The Opalescence Go kit includes pre-filled mouth trays that contain the whitening gel. As one of the more user-friendly kits, opening the package and placing the mouth tray on the upper and lower teeth is the extent of the process. You can choose between kits that have a 10 or 15 percent hydrogen peroxide concentration. With the 10 percent kit, application time runs for 30 to 60 minutes. The 15 percent kits require a 15 to 20-minute application time. Five to ten days of consecutive use produces the best results. 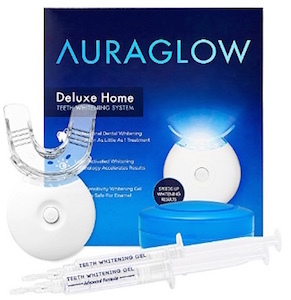 The AuraGlow Teeth Whitening Kit combines the effects of a whitening gel with LED light using a one-size-fits-all mouth tray. Like other kits that work with mouth trays, the whitening gel is placed in the tray. The tray has an LED light attachment that allows the light to shine directly into the mouth. Treatment time takes 30 minutes with a recommended seven to ten days of consecutive use for best results. The LED light device that comes with this system is advertised to produce five times more light than other kits using similar technology. The increased light strength activates the whitening gel, delivering quicker results. The device also has a timer mechanism that beeps every 10 minutes to help you keep track of the time. 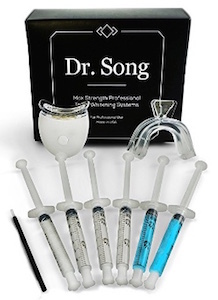 Dr. Song’s kit whitens your teeth using a whitening compound that’s spread across a mouthpiece or gum guard with a syringe. The compound contains 35 percent carbamide peroxide. It also has an LED blue light activator that you hold in place with your teeth to activate the compound. The product advertises noticeably whiter teeth after three uses. 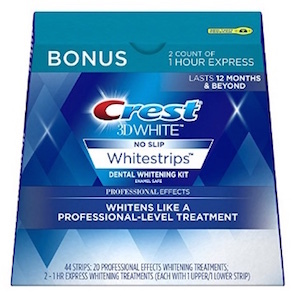 Crest 3D White Professional Effects Whitestrips offer a one-step system for whitening your teeth. 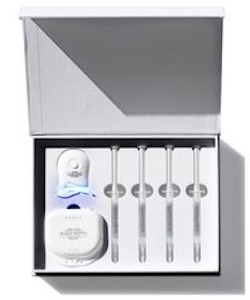 The kit includes 14 white strips that use a professional-level Advanced Seal Technology. The seal works by gripping the teeth, creating a non-slip surface. The manufacturer advertises the product as capable of removing 14 years of stains off the teeth after 20 consecutive days of use. Ingredients contained in each strip include hydrogen peroxide, sodium hydroxide, and carbomer 956, which is a salt compound. 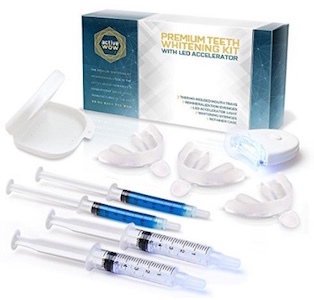 The Active Wow teeth whitening system comes with whitening mouth trays, prepared syringes that contain the whitening gel, and an LED light mouthpiece. This system also comes with remineralization gel applicators that help strengthen the teeth between treatments. The mouth trays must be heated beforehand so that the tray can mold around the teeth when inserted. Active WOW advertises noticeable results after one treatment. The Pearly Whites Professional Teeth Whitening Kit works much like the other tray-based, LED light accelerator systems. This system includes syringes for placing the whitening gel in the mouth trays and an ultra-bright UV LED lamp. Once you fill the trays with the gel, the tray is placed on the teeth. You then clamp the light to the front rows of your teeth for 45 minutes. 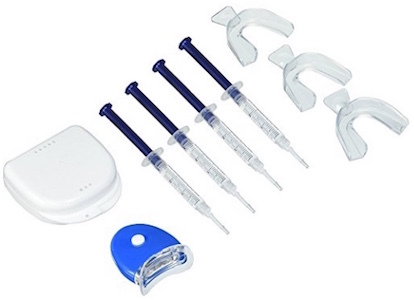 As the least expensive at-home whitening treatment in our list, the Amazing Smile Professional Teeth Whitening Kit contains the basics: four applicator syringes for the whitening gel, three mouth trays, and an LED mouthpiece. The active ingredient in the whitening gel is carbamide peroxide at a concentration of 44 percent. As with the other systems, the mouth trays must be heated before use. Application time is 30 minutes. Amazing Smile advertises noticeable results after one treatment. Teeth whitening kits offer a quick, convenient alternative to costly dental procedures. If you’re the kind of person who doesn’t mind doing 30- to 60-minute treatments every day for several days in a row, then an at-home teeth whitening system may be the best way to get the pearly white smile you’ve been wanting.